The Who might have been “Talkin’ ’bout My Generation,” but chances are your organization spans several generations. Maybe you have employees born in the Eisenhower era. Maybe some were born when Bill Clinton was in office. Whether in their twenties or sixties, or beyond, each person has unique — and often surprising — skills and experience to offer. One of the keys to a strong, successful organization is for those of all ages and eras to listen to, and learn from, each other with respect. But, first things first. What do we really mean when we talk about “workplace culture?” It’s the character and personality of your organization, what makes it unique, and is the sum of its values, traditions, beliefs, interactions, behaviors, and attitudes. There are many reasons to care deeply about a great workplace culture, including what it means to your ability to recruit and retain top talent. It allows employees to find non-financial value in their jobs; helps you to deliver consistent, high-quality work; builds effective relationships with colleagues, donor, volunteers and others; and fulfills the missions and visions of organizations, resulting in more revenue raised, and greater growth and sustainability. Right now, for the first time in history, there are five generations in the workplace, a fact that presents a number of challenges and opportunities. The five generation span has been created, in part, by people living and working longer, and by “Gen X” spanning fewer years and having lower birth rates than other generations. 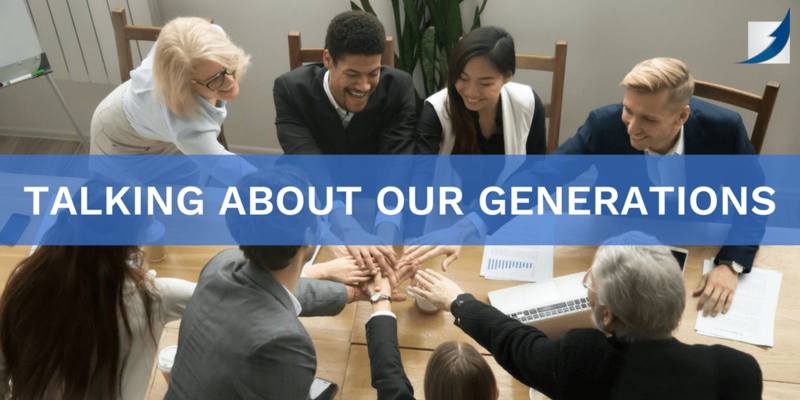 The five generations fall into these categories: Traditionalists, born in 1945 and before; Baby Boomers, born between 1946 and 1964; Generation X, born between 1965 and 1980; Millennials (Gen Y), born between 1981 and 1994; and Generation Z, born in 1995 and after. 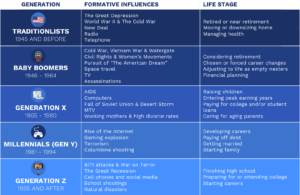 While there might be some overlap, each generation grew up with unique formative influences, and is at a specific stage of life. While those ideas are just myths, the reality is that multi-generational workplaces do present some challenges, among them handling different communications preferences (phone, email, text, etc.) and having managers supervise workers of a different — perhaps older — generation. But opportunities are there, too, from implementing reverse mentoring to establishing a strong culture of lifelong learning. So, throw away your stereotypes, embrace the “generational divide,” take a chance on someone looking for a meaningful second — or even third — career, encourage collaboration and teamwork… and you and your workers of every age can look forward to a better, stronger, more successful organization. Editor’s note: This blog is adapted from a recent DonorSearch Flash Class presentation made by David Munshine, President and CEO of The Munshine Group.